This article is about our experience when we helped one of our customers to organize support tickets by customizing the support form. We managed to change the way they assigned support tickets, from a manual and time-consuming process to an automated and efficient one. Our customer, an online gadget store owner, approached us with an issue regarding their support tickets. Their support ticket count suddenly has increased to around 120 (earlier they had about 30 tickets daily). Their Customer Support Head, Michael, along with his team members Lisa, Paul, and Lorenzo were having trouble in managing and assigning such a huge surge in the number of tickets. All they wanted was an easy and efficient way to deal with all those tickets. After banging their heads around a number of solutions, they had finally came to us for help. But did they really get what they wanted? The very first thing we had made clear to them was to let go of Emails as a way of gathering requests. 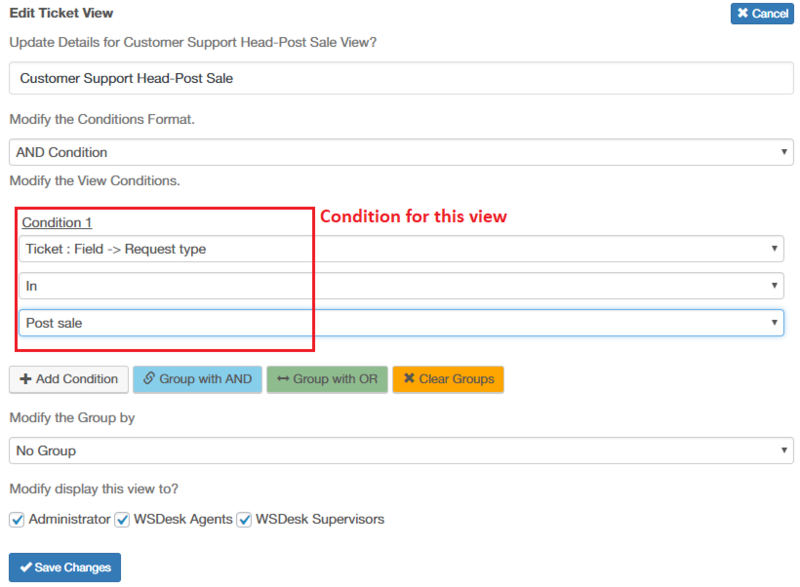 What they needed was a Support Form which could help in filtering the requests based on the comfort of Michael and his team. 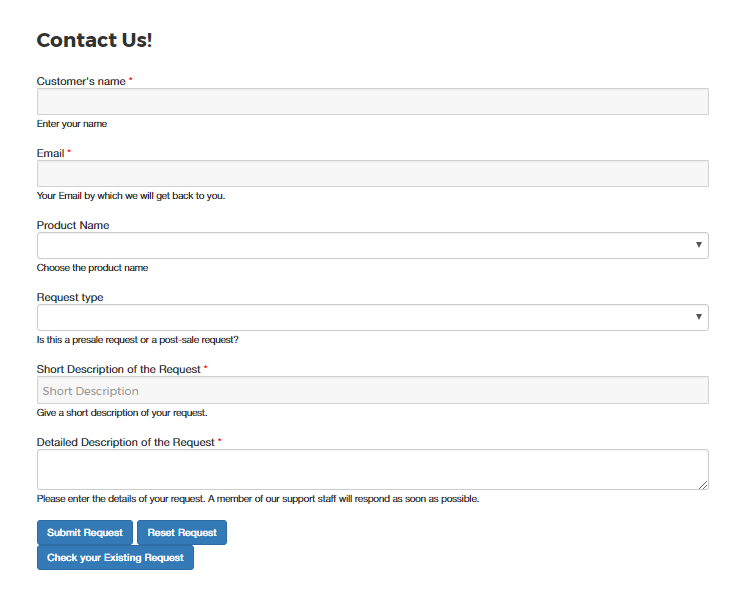 So we started working on a customized support form. They took their time thinking about the details, they wanted in their support form. Apart from details like Email ID of the customer, Short and Detailed description of the request, which were already there, they wanted three more fields to be filled by customers in advance. Apart from adding Customer Name, which was an easy task, they also wanted requests to be divided among their team members based on either the name of the product or the request’s priority. This request of theirs really made us think for a while. 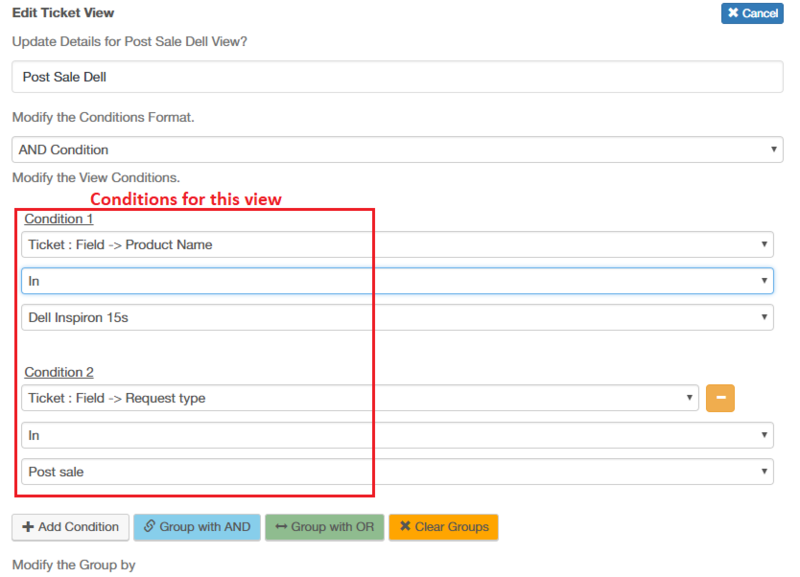 They wanted Product Name and Request Type to be added into their form. So the tickets would be easy to categorize based on different products and the request sales type too. 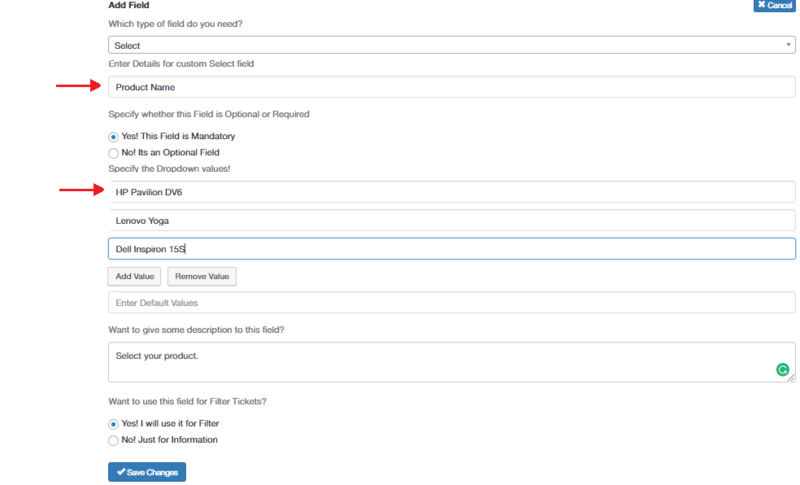 So we manually added two mandatory drop-down fields. Product Name had a list of all the available products that they provided, particularly laptops such as, HP Pavilion DV6, Lenovo Yoga and Dell Inspiron 15S. 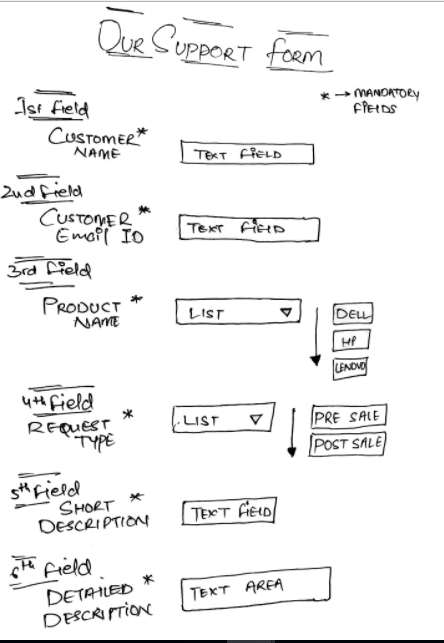 Similarly, the Request Type had two priority options as Pre-Sale or Post-Sale. Seeing this form made them really excited. But the real challenge was just about to begin! The elephant in the room- Automation! The support form was working wonders. Every detail they wanted was now available to them. But all their happiness and excitement vanished as soon as they noticed that ticket assignment was again dependent upon Michael. There was no sign of automation so far. 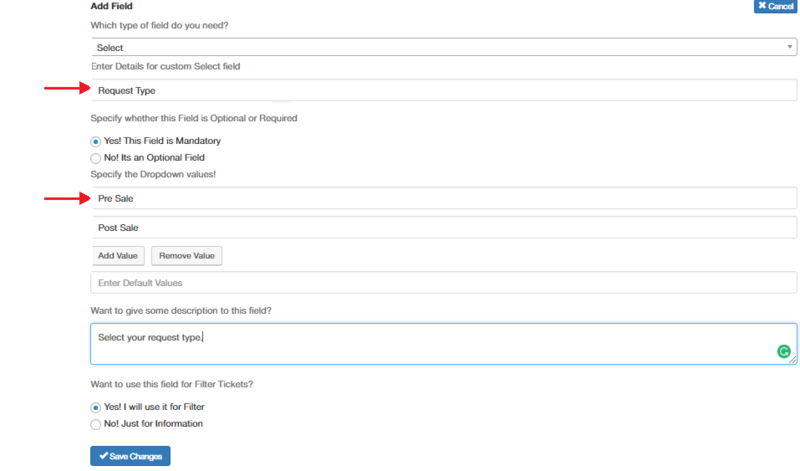 Automation was totally based on the details provided in the support form. Using those details we could create a separate view for each and every category they wanted. But for simplicity, they stuck with just five views. Two of the views were totally for Michael’s use as he wanted to see both Pre-Sale and Post-Sale requests separately. The other three provided his team members with a separate view of those requests, which they required to handle. Michael’s views were a bit complex to create. Though his views were easy to understand yet difficult to implement logically. We had to combine all the requests that were Pre-sale or Post sale, regardless the product name. We named these views as Customer Support Head-Pre Sale and Customer Support Head-Post Sale. Now it was time to make it happen for the team members too. We named the remaining views as Post Sale-HP, Post Sale-Lenovo and Post Sale-Dell, respectively. What each member of that team wanted was to be able to view his share of requests automatically. And as Michael was managing Pre-sale requests himself, they just had to manage the Post-sale ones. So all we needed was to show them Post-sale requests of their respective products. After all the hard work, all they wanted was results. They had seen the support form and were very happy about it. Now it was time for them to see the beauty of the custom views based on the support form customization that we did earlier. We also talked to all the team members about the newly added functionalities and how exactly they can use it to their fullest. For simplicity, we told every team member to just click on the view related to their product. and it would show all the tickets that were to be managed by them. And for Michael, we told him that he would be having 2 separate views where he can manage his priority customers based on pre and post-sale requests. The same goal they had in mind! It was just a week later when we received an email from Michael, in which he had mentioned the changes that he and his team had witnessed since our last meeting. They needed help with their work efficiency. And as always, we were happy to help. In a short period of 3 weeks, they were not only able to manage those 100-120 tickets properly, but they also managed to decrease their first response time drastically. What more could they have asked for?